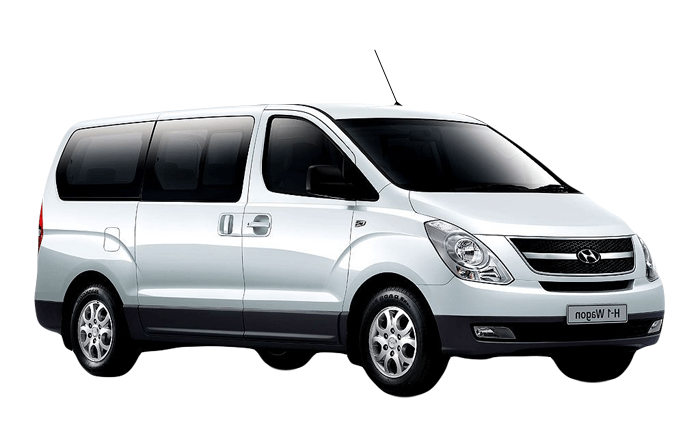 When choosing a spacious vehicle for hire , look no further than the Hyundai H1 as it is a perfect people carrier for groups of 8. This minivan is the industry standard (replacing the Vito) and it’s able to accommodate many bags efficiently; roughly 4 large bags and 8 small bags. However, a trailer will be required for 8 people with full luggage (1 big bag and 1 small bag each). If you are embarking on a golf tour, 8 sets of golf clubs can be accomodated. The Hyundai H1 is a diesel vehicle with an automatic transmission and is able to carry a full load. The VW T6 Kombi (also called Caravelle) is a diesel operated vehicle, meaning it is more fuel efficient, costing you less per kilometre. It has a manual transmission and has sufficient power to carry a full load. The Toyota Quantum is ideal for carrying 10 people. In the Hyundai H1 there are no windows in the back as the vehicle has doors on both sides, therefore, photography can be done from the front seats and the row of seats directly behind the driver. The Toyota Quantum minibus is ideal for photography as it has 2 windows on the left and 3 on the right. To get the full specs and details see our blog post on the best minivan to use in the kruger park. If you are planning a game drive from Johannesburg to the Kruger National Park, Pace car rental is more than happy to deliver you to your hotel from our offices in Marlboro, Sandton. Trailers are available at R100 per day if you are renting an 8, 9 or 10 seater. All Pace Car Rental’s minibuses have tow-bars and we can arrange a trailer for you should you require one. Remember that Pace Car Rental allows all of their people carriers to cross the border into Zimbabwe from Johannesburg.